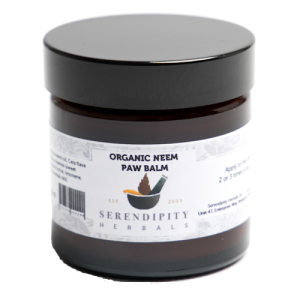 Neem Paw Balm will soothe and heal cut, sore or dry paws. Its completely natural formula doesn't contain any artificial preservatives, fragrances or chemicals and will help keep your pets paws in top condition. Use a knife or spoon to remove a pea sized portion from the jar and warm in the palm of your hand to soften. Apply liberally to the damaged area as often as necessary and especially before walks. Can also be used elsewhere for minor cuts, grazes and dry patches. Very good service. I am sure the balm will be good although I have only just started using it, the balm feels good and my dog’s paws are soaking it up. Our dog has itchy feet so this is used regularly and works brilliantly at calming the sore patches down to stop him fussing and licking them and making it worse. Would recommend.